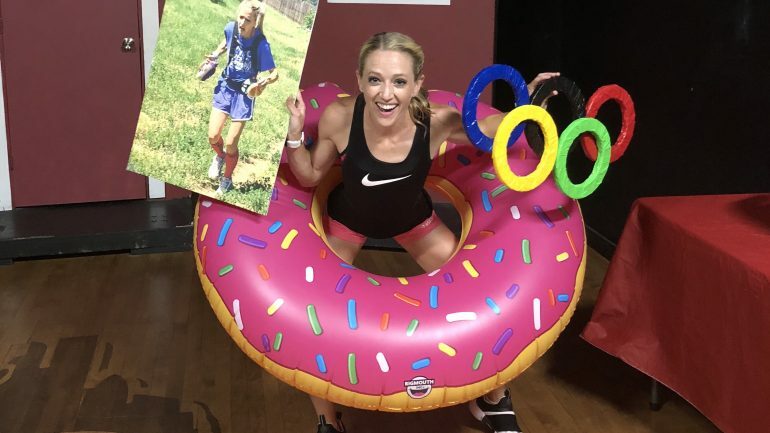 Denver-native Brittany Charboneau, also known as “The Funny Runner”, is a professional marathoner who is simultaneously chasing her passion for comedy and acting (pun absolutely intended). Brittany ran Cross Country and Indoor/Outdoor Track & Field at Colorado State University. Following college, Brittany began her marathon debut at the 2012 Colorado Marathon. It wasn’t until her first place finish and new course record at the 2017 Colfax Marathon in Denver that Brittany decided to take her marathon career to an elite level. She went on to win the 2017 Kansas City Marathon, and swept the runDisney race series in early 2018 with her wins at the DisneyWorld Half Marathon, Disney Princess 10k and Star Wars Dark Side Half Marathon. The Los Angeles Marathon saw a sixth place overall finish, second American and an Olympic Marathon Trials qualifying time of 2:36:35. She has her sights set on qualifying for the 2020 Olympic Marathon and will be competing at the 2018 New York Marathon. While pursuing running, Brittany has also debuted her one-woman comedy show that showcases her 17-year running journey in Denver in June 2018. “My Long Distance Relationship with Running: From the Early Miles to the Olympic Trials” will be making its way to Chicago during the Chicago Marathon weekend this fall.